The Ancient Egyptians cultivated their own vines which produced both red and white grapes. Wine was only drunk by the wealthy Ancient Egyptians. The method for producing wine by first pressing the grapes and then treading the grapes and the resulting liquid produced the finest wine. A lower grade wine was produced from squeezing juice from the left over pulp, pips and stems. Wine then had to be sieved before pouring. The wine was placed in wine jars which were labelled to indicate the vintage, or date of the wine. Wines were a favorite drink and came in different varieties of red and white, sweet and dry. The items buried with pharaohs included wine jars. 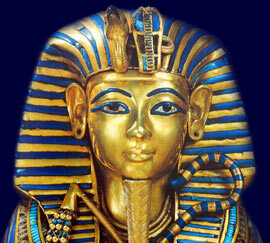 In the tomb of King Tut, Tutankhamun, a total of 36 wine jars, complete with date labels were found. Ancient Egyptian wine preservation methods included the addition of resin which acted as a preservative. Although beer and wine were the main types Ancient Egyptian drink the wealthy would also drink fruit juices and milk. Water was not considered clean as the Nile was filled with bacteria from waste and excrement.